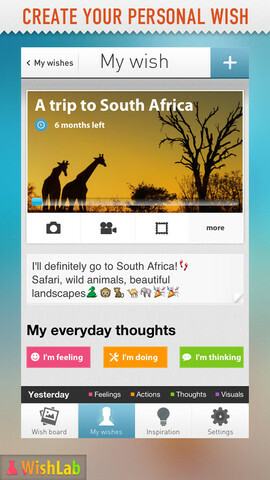 The first winner of our Free App Poll in 2013 is WishLab by BUMPERAPPS LTD! Created on theoretical studies of visualizing your goals, dreams and success, WishLab helps to mentally and visually concentrate on your goals and wishes. Featured on more than 100 App Stores, this free app helps materializing your thoughts and work on them to come true. This powerful everyday visualization tool provides the motivation to work on every single thing you want to accomplish, may it be getting a new iPhone, starting a relationship or landing an exciting job. You are able to even track your progress on each wish and capture your thoughts, actions and feelings. Add photos and videos and put your wishes on a wish board for better visualization, focus and interaction. Reminding you of the things that matter the most with email alerts and push-notifications, WishLab also allows you check out the Wall of Inspiration to get motivated by wishes of others that came true. • Keep a diary of your fulfilled wishes and share your success story. The latest WishLab version of 1.0.2 has brought additional enhancements and fixes, such as: iPhone 5 optimization, improved performance of lists and tables and other stability and compatibility improvements. WishLab is available in the Apple App Store for FREE and requires iOS 4.3 or later to be fully functional. So why waste your time? Achieve your wishes through the power of your feelings, thoughts and actions, go and grab WishLab now!